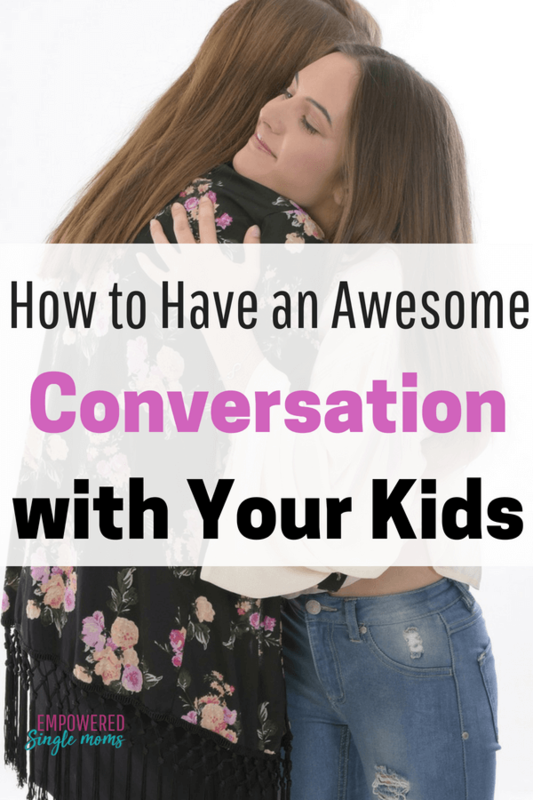 Inside: Using open-ended question is the key to having amazing conversations with your kids. You are tired from working all day and know you need to get dinner ready fast before leaving again to take one of the kids to an activity. You want to make the most of the little time you have together and have a real conversation. Their response: “Fine.” If your child is in middle school, maybe you just get a grunt. It is so frustrating. You are trying, but your darling children are drifting further away from you each day. There is a better way. 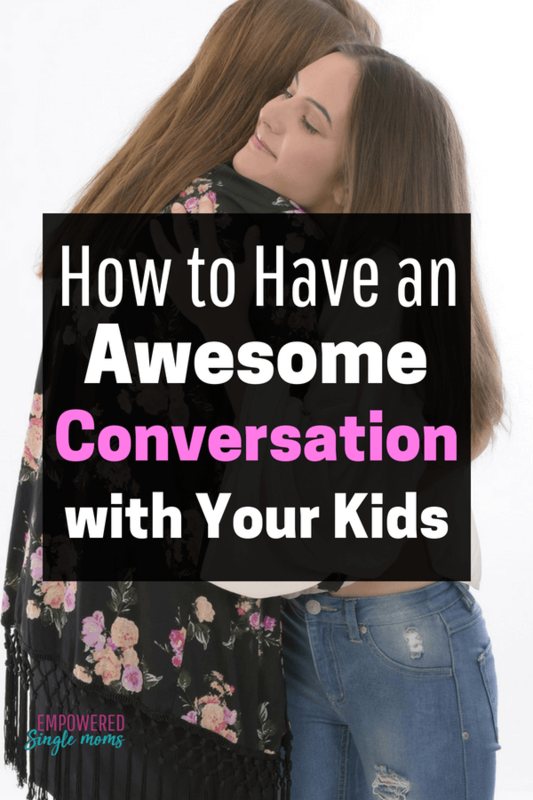 You can have amazing conversations with your kids if you learn to ask different questions. Often, parents ask closed-ended questions that are easy to answer with one word. Try these open-ended questions for kids to get the conversation flowing at your house. Pretend games are great opportunities to have conversations with preschoolers, and puppets like this one or stuffed animals are helpful tools to get your preschooler talking. Preschoolers love to pretend, so let them talk for their stuffed animal or puppet, or play dress-up and encourage them to pretend to be a grown-up or a character from a story. If you ask what their teddy bear is thinking or what their puppet plans to do, preschoolers tend to be more responsive than if you ask them questions about themselves. Try some of these ideas. Why is Teddy afraid of the dark? What do you think would make Teddy feel safe? What was the most fun thing you did today? Who did you do it with? When reading a favorite book ask, What do you think would happen if…….. and suggest that the character do something different. What is your favorite food? What makes it your favorite? What other foods are like that? What is your favorite playground? What makes that your favorite? What is your favorite thing to do on a rainy day? What do you like about__________? What is the weirdest thing you have seen someone do? What joke can you tell? What is the funniest nickname you have heard? What was the best part of your day? If you could live in a different time in history, when would you choose and why? If you were the president, what would you do first? What is something interesting you learned today? Who is one of your favorite YouTube celebrities and what do you admire about him/her? What podcast do you like listening to? What is it about? What book are you reading? Tell me about it. 12. How do you like to show your love to other people? 13. What makes _____________a good friend? 14 Who is your favorite teacher? What makes him/her your favorite? 15. When is a time you felt sad and how did you deal with the feeling? 16. When is a time you were nervous/anxious? Did the feeling stop you from doing what you wanted to do? 17. How do you calm yourself when you feel anxious? Often kids are more talkative when you are sharing activities together. Here are 42 fun activities to share with your kids. Don’t forget: these open-ended questions for kids are great for adults too! The next time you feel like you don’t know how to start a conversation with someone, pull one of these out of your toolbox. Or, you can share these questions with other frustrated parents who are trying to have meaningful conversations with their kids. Enjoy the interesting discussions these questions will spark as well as a deeper understanding of your kids’ perspectives. You can ask these questions at mealtime or in the car. It seems like the older kids get, your car time with them gets more valuable. They are often more likely to talk when you are not looking right at them and there is something to distract you just a bit. 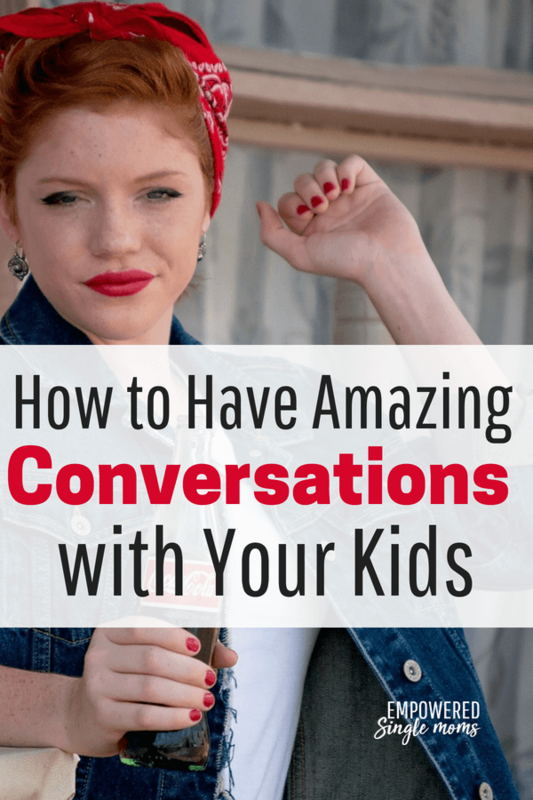 What are some of your favorite questions to get a conversation started with your kids?